Why realtors are adapting real estate digital marketing by leaving traditional marketing? Nowadays people are more dependent on the internet for looking at real estate properties as the internet provides ease in carrying out any activity like booking appointments to see property by sitting comfortably at home. Internet appealing features is one of the reasons which made the realtors shift from traditional to real estate digital marketing. This shift to internet channels like web pages and apps, emails for research and buying has become the driving forces for the future of real estate industry growth. With over 200 million active websites, over 4 million apps and 2.77 billion social media users. The importance of these real estate digital marketing has grown to the extent where they have become the primary source of revenue for several industries. It provides the audience with the option to opt in or out, unlike traditional marketing where it doesnâ&#x20AC;&#x2122;t provide a chance and segment audience based on their preference. 1. Real Estate Digital Marketing Benefits 1.1 Saves Time Forget the budgets that swell beyond the limits you have set for your TV commercial. Have you ever calculated the time it takes to produce a TV commercial? Many times, it goes beyond days to months. 1.2 Increase Return On Investment (ROI) Measuring your real estate digital marketing campaignsâ&#x20AC;&#x2122; effectiveness with web analytic tools is a great way to increase your ROI. 1.3 Easy to Implement and Use From social media accounts to email marketing, implementing your strategies and achieving your pre-defined goals can be done by any realtor or developer irrespective of their expert level. 1.4 Offer Unforgettable User Experience You have better chances to reach real estate digital marketing objectives than unplanned user experience with the help of rich media and engaging elements like emotion and message. 1.5 Helps to Stand Out from the Crowd Real estate digital marketing offers extraordinary ways and means to present your unique marketing ideas and several types of content. 1.6 Nurture your Clients Nurturing your clients is nothing but making sure your connection with the client is adding value to him by helping him achieve his real estate goals. 1.7 Customer Engagement Having a real estate digital marketing strategy that only engages the customer for a particular moment is not a successful customer engagement strategy. 1.8 Builds Strong Customer Relationship Your customer is your business, so your first job is to know them well. Every customer are not the same; they have similarities, but each has its preference. Donâ&#x20AC;&#x2122;t forget your customers once the deal is final, ask for a reference, feedback and send them greetings on their birthday, property purchase date make them feel special from your side. 1.9 Precisely Target Audience Donâ&#x20AC;&#x2122;t try to focus on the large area; run real estate digital marketing campaignâ&#x20AC;&#x2122;s with the local audience. After covering your local audience, you can work beyond in the long run. Donâ&#x20AC;&#x2122;t forget the probability of conversion of lead is more when you target the local audience than the general audience. 1.10 Reduced Advertising Cost In addition to providing features like customizing the size of the Ad to targeting a particular audience, real estate digital marketing costs profoundly low on your budget. And the reach of your audience is also several hundred times more than traditional marketing. Itâ&#x20AC;&#x2122;s better to focus on real estate digital marketing; on online you can do both free and paid advertising based on your budget needs. What will be your reaction when your traditional real estate digital marketing campaign did not go well because your customers arenâ&#x20AC;&#x2122;t informed about the terms & conditions of your discount campaign. 1.12 Customer Feedback What is the target of your real estate digital marketing campaigns? Is it only to grab the attention of the customer towards your offering! Then you are missing out on what the customer wants. Many times it is the customerâ&#x20AC;&#x2122;sâ&#x20AC;&#x2122; perspective that adds significant value to your offering if you take in the right perspective. With real estate digital marketing, you can let the customer share their feedback to improve your product features and the overall offering. 1.13 Performance of the Marketing Initiatives Did you know how many of your customers saw your billboard on the road vs the number of people showed up at your construction site? 2. How to Start Real Estate Digital Marketing? 2.1 Creating a Mobile-Friendly Website In this digital world, where you couldn’t find a person without a smartphone in their hand. The number of mobile users exceeded desktop users. So you don’t have any option other than to build your mobile friendly website. 2.2 Establishing a Brand – Website Having a website is not enough; you need to inform the customer about your real estate properties. 2.3 Inbound Marketing Inbound marketing helps your audience to find you and filter the audience who are not interested in your business. 2.4 SEO (includes Creating a Blog) & Local SEO, SEO rankings SEO (Search Engine Optimization) is one of the most important real estate digital marketing strategies that can help you to get visible in organic search results. Itâ&#x20AC;&#x2122;s a long term process, but it will bring organic traffic to the website in the long run. SEO divided into off-page and on-page for better understanding. With the help of SEO, you can target the right audience to your website. 2.5 Start Online Advertising (Google Adwords & different kinds of ads) Online advertising you can carry out either free or pay. Free advertising you can do by posting it in any social media sites. Paid advertising often people use is pay per click advertising or programmatic advertising. 2.6 Social Media Marketing (Organic & Paid advertising on Facebook, Twitter, LinkedIn, YouTube, Instagram) In real estate digital marketing social media marketing plays a very significant role. Social media platforms come up with a list of features to attract your audience. In Facebook, have the option to go live and create a video Share Instagram stories Post videos on YouTube Share articles on LinkedIn Pin photos on Pinterest Tweet or retweet your know-how Use Facebook messenger chatbots and many others. Make use of the mail Ids which are currently being used by the audience; otherwise, itâ&#x20AC;&#x2122;s futile to send them. 2.8 SMS Marketing SMS marketing always has a good open rate from its inception. SMS marketing was the trend before, and still, we canâ&#x20AC;&#x2122;t ignore the SMS marketing. On average, SMS is opened within a short interval of time after itâ&#x20AC;&#x2122;s received. 2.9 Programmatic Marketing Programmatic marketing is the future of marketing. It makes use of artificial intelligence to carry out media buying decisions. It provides the platform to the publisher and advertiser to buy or sell the Ad spaces with the automatic process. 2.10 Affiliate Marketing In affiliate marketing, you can invite some people who are interested in promoting your properties. Whenever a lead conversion happens, they will get the commission for purchasing using their link. Itâ&#x20AC;&#x2122;s an excellent way to get leads without much effort. 2.11 Influencer Marketing There are some people in the local and global level whose words matters to the audience. 2.12 Content Marketing Create a blog content that your website viewers are interested in, like providing information about available properties that suit different customers budget. 2.13 List your Company on Google My Business Google My Business profile acts as a tool to showcase the credibility and customers liking of your real estate brand on the SERP (Search Engine Results Page) itself. Moreover, these customersâ&#x20AC;&#x2122; feedback will promote your business to new customers in google maps and search engines. 3.2 Meet New People. (ex: go to seminars & big events in your niche) Join in online realtors communities, forum discussion, Facebook groups and offline events where the realtors from different areas gathered. 3.3 Contact Sellers with Expired Listings Many people scared of calling to the expired listings people. The reason for expired listings may be because they already purchased, their loan didnâ&#x20AC;&#x2122;t get sanctioned or any other if you have an idea that they are interested in buying or selling at some point of time and dropped because of some reason. You can approach them by a call; it will not cost you, then why donâ&#x20AC;&#x2122;t you do. Sometimes you get leads even from expired listings, and here you donâ&#x20AC;&#x2122;t need to put much effort into explaining related to property, because they are already aware of everything. 3.4 Run Lead Generation Campaigns in Digital Marketing Channels Lead generation campaigns you can run in different real estate digital marketing channels likeSMS, Email, DIsplay, and Video campaigns. Itâ&#x20AC;&#x2122;s better to do experiment with different channels and network and analyze the results you will get an idea which is generating more leads for your business. 3.5 Create a Lead Capture Form in your Website Lead capture form in your website helps you to collect the information of the audience who are most likely interested in your business. 3.6 Use the Power of SEO SEO is a long term process, but it will bring you potential leads from your website. It always keeps you rank high in search engine results as long as you put your effort into it. Google changes its search algorithm frequently, so to rank high, you must be updated with the Google search algorithm. If youâ&#x20AC;&#x2122;re following the same real estate digital marketing strategies without any updates, it will not help you in fetching your result. Website speed Page rank Plagiarism Performance of headers URL Titles Meta description DA Click rate Bounce rate Page views Time spent on page and many more You can use these tools to improve your SEO. 3.7 Social Media Social media platforms act as free marketing tools that are mostly free. Apart from holding an exponential amount of people in one place. 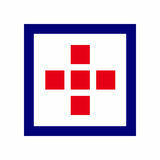 Excluding the fixed expenses that you spend on your marketing persons used to operate your real estate brand handles. 3.8 Do Content Marketing Content marketing always considered as the king in SEO and prominent real estate digital marketing strategy. Content is one of the sources to attract the audience to your website. You need content at every stage of your advertisement like in social media, blog, SEO, PR, PPC and other. Content marketing automatically drives traffic to your website; you donâ&#x20AC;&#x2122;t need to push them. 3.9 Use Facebook Marketplace A Facebook marketplace is an advanced real estate digital marketing strategy. It enables you to sell or buy anything in a single app for free. Billions of people make use of Facebook and millions of people active on every day. Itâ&#x20AC;&#x2122;s a perfect place to reach a large number of audience for free. 3.10 Purchase Data from Real Estate Websites There are many third-party data providers sources available in the market. You can purchase a list of customers data who are looking for real estate properties. 3.11 Use Location Services to Optimise your Real Estate Conversion As a real estate developer, the need to target a wide range of geographic area is very minimal in most cases. The better you can narrow down your target audience, the better your conversion rates will be. 3.12 Geofencing Have you ever had the capability to deliver what your customers wanted? With advanced real estate digital marketing capabilities, real estate developers can achieve their dream of serving what their customers want. This location-based marketing will get much better if you have the customerâ&#x20AC;&#x2122;s data related to their income, age, occupation, interests, and other data. 3.13 360-degree View of Properties Adopting the latest technology that is relevant to your industry before your competitors do, is a great way to gain first mover advantage. 3.14 Whatsapp to Reach your Customer Nobody likes phone calls or direct messages from unknown numbers. What if you have sent a personal message from your official business handle. Additionally, WhatsApp would be a great communication channel for realtorsâ&#x20AC;&#x2122; whose customers are more likely to be in hundreds or thousands. Due to the small scale of customers and Whatsappsâ&#x20AC;&#x2122; wide reach, it will be quite easy to reach your customers at any point through real estate digital marketing. 3.15 Right Audience Targeting Have you ever had a clear idea of your target audience for your real estate digital marketing campaign? Promoting your real estate properties to every property buyer is like having a cluttered real estate online marketing strategy. 3.16 Infographics Almost 90% of the information that we transmit into our brain is visual. Because of this, our minds are most likely to understand a picture more easily and quickly than text. Compared to content â&#x20AC;&#x201C; infographics are 30 times more likely to be read. Incorporating infographics into your real estate digital marketing strategy is a great way to engage your home buyers. 4. Real Estate Marketing Tips, Ideas, and Strategies 4.1 Add Social Sharing Icons to Property Pages. Add social sharing on every web page and landing pages. Also, add a social media sharing icons on every property page you create. 4.2 Put your Contact Info on Every Page of your Website. Add your contact details in every page of your website through HTML code. It helps your website visitors to get details on the same page instead of navigating to your contact page. 4.3 Create an Awesome Business Card which is Unique. Create an appealing design business card bright and playful. Cover all the points which you want to convey to your audience in a concise and crispy way. No one wants to read content on the website until itâ&#x20AC;&#x2122;s informative and useful to them. Also, Donâ&#x20AC;&#x2122;t lose the frequency which you maintain for posting articles or sending a newsletter on mails. Posting valuable information will help you to build the trust of the audience and building a brand image. 4.5 Make Your Site Mobile-Friendly. People prefer spending online time on mobiles than desktop. If your site is not mobile friendly, it will make the visitor frustrated because of the loading of the website, content hidden by image, content not fit the screen, loading of images and many others. 4.6 Start Email Nurture Campaign. An email nurture campaign is a sequence of emails that are sent based on the audience behavior, to deliver on time, information that can help the audience during their buying process. Your emails help them to take their next step easily without much thinking on it. Make use of consistent navigation. Segment the categories. Use proper headings with links. Use ALT text for every clickable image. Include a site map in your website which defines how your website organized. Use simple language. Link to a logo that points to the home page. 4.9 Run Contests in your Niche Organizing a contest is engaging and fantastic way to attract a genuine list of leads. For Real estate business, contest ideas work well for them. 4.10 Use Chatbot on your Website Chatbot will act as round the clock customer service support to your audience. Even, when your customer support team not present at their seat. 4.11 Deliver What you Promise Donâ&#x20AC;&#x2122;t add fake promises on your website and any other real estate digital marketing channel. Focus on all the features which youâ&#x20AC;&#x2122;re good at providing. Educate your audience about everything before they deal. Make them aware of any risks so that they can decide according to that. 4.12 Think Outside the Box Don’t get stuck with a list of ideas or strategies you used to implement. Look for the opportunities and updates in advanced technology execute the same to grab the attention of the audience. 4.13 Engage your Audience in Social Media (always be active) Make your online presence through social media. Regularly post some informative content that engages your audience on your social media posts. 4.14 Hire a Pro-Photographer To run any of your real estate digital marketing campaign’s you need appealing images. For this, you should hire a professional photographer. It will not cost you more; itâ&#x20AC;&#x2122;s a one-time photo shoot and which can help you share everywhere you want to do an advertisement for it. 4.15 Answer Questions on Quora Enroll in quora and provide answers to the questions of realtors and home buyers or sellers. At the end of solutions, you can introduce yourself and your real estate business to the people. People come to know that youâ&#x20AC;&#x2122;re an expert in this field and they approach you whenever they have any questions in mind related to real estate. In the future, if they want to purchase some property, they may take your advice. 4.16 Start Guest Blogging To rank in SERP, in this highly competitive digital world, you need to do something extra. 4.18 Offer Something Free on your Site. People generally get excited to get something for nothing if you can offer something interesting along with the sale of the property then people more interest in that. 4.19 Add a Quiz to your Blog. Generally, people want to know their expertise in their field. And they show interest in attending the quiz and answers for which they failed; they search on your website. Run a quiz with some set of questions which helps them to analyze their knowledge. It helps the audience that youâ&#x20AC;&#x2122;re proficient in this field, and more probably they contact you for advice or getting any other information they need regarding real estate properties. 4.20 Try to be as Unique as Possible in all Aspects. Make your unique presence in the market. Donâ&#x20AC;&#x2122;t copy any other brand, build your brand. 4.21 Do Competitor Analysis (keep an eye on your competitors) Always keep an eye on your competitors. Consider every step your competitors take to carry out their operations. 4.22 Use Drone Photography Drone photography is used to capture aerial images of some places. A high flying camera will capture the areas which you canâ&#x20AC;&#x2122;t capture from our normal cameras. There are some restricted areas where you canâ&#x20AC;&#x2122;t capture the properties completely there you can take the help of drone photography. 4.23 Always Do A/B Testing. Analyze the various real estate digital marketing strategies your competitors are applying to draw the attention of the audience. 4.24 Send Personalised Cards or Gifts on Milestone Dates. Collect the information of your customers once the deal gets finalized. Make a reminder to send them personalized cards or gifts on their purchase dates. Itâ&#x20AC;&#x2122;s one of the ways to get engaged with your audience even if they are no longer your clients. 4.25 Google Alerts Have you ever wondered, what digital media is talking about your real estate brand or company? Google alerts a great way to keep track of new media publications about your real estate brand. To have this notification in your mail, you need to create alerts from your Gmail account by typing the keywords for that topic and clicking on the â&#x20AC;&#x2DC;+â&#x20AC;&#x2122; icon. 5. Top 3 Real Estate Companies using Digital Marketing Many top real estate companies already practiced real estate digital marketing and getting benefit out of it. Most of the companies reached to the next level only after adopting real estate digital marketing for their business. Godrej Properties Ltd Godrej Properties Ltd is one of the leading real estate company in India. It was founded in 1897, and are into the various industries like Online Grocery Store, Real estate, Consumer goods, Agri, and Chemical business. Sobha limited is one of the leading real estate companies that have a strong digital presence in the Indian market. Itâ&#x20AC;&#x2122;s aimed at offering a global lifestyle experience to their audience. They understand the importance of online marketing for real estate with the collaboration of Webduraâ&#x20AC;&#x2122;s association which leads to the transformation of their real estate digital marketing platform. Good real estate digital marketing budget and they spent on Google Ads and other social media marketing campaigns. Active social media presence on Facebook, YouTube, Instagram, LinkedIn, Twitter, and Pinterest with good followers. They spent their time and digital budget to provide valuable information to their clients related to their brand, tips related to property, corporate news, quotes and similar other. Urban Tree Infrastructures Urban Tree has considered as one of the leading real estate brands which have a good online presence. Its website is SEO optimized and has a strong social media presence. Urban Tree has a blog on their website in which they regularly update interesting articles which they do real estate digital marketing for that in their social media profiles likeFacebook Twitter LinkedIn Pinterest YouTube And Instagram They follow the frequency of their website posting without missing. And ensure to spread their post to a wide range of audience in their database. Frequently they run campaigns based on the trending topic in the area such as â&#x20AC;&#x2DC;Anti-tobacco dayâ&#x20AC;&#x2122;. From their post, they spread a strong message to their audience. Conclusion Digital marketing for real estate business will act as a ladder to reach your business goals. If you’re still following traditional marketing technique, you’re actually sending your audience to your competitors. To stand out from your competitors, you need a strong digital presence. People more inclined to what they see and hear, you can take this opportunity to attract your audience. Real estate digital marketing provided you with lots of options for Ad formats, various marketing channels, and exciting features to create Ads. Creativity in your contents will help you to drag your audience to your business without much effort. Real estate digital marketing provides you with an opportunity to track your progress and work on your pitfalls. It also helps you to target audience on a granular level precision which saves your efforts, time and advertising cost on the irrelevant audience. Real estate digital marketing is the best source to engage, contact with your audience, build trust, & loyalty of your customer moreover to build brand image. 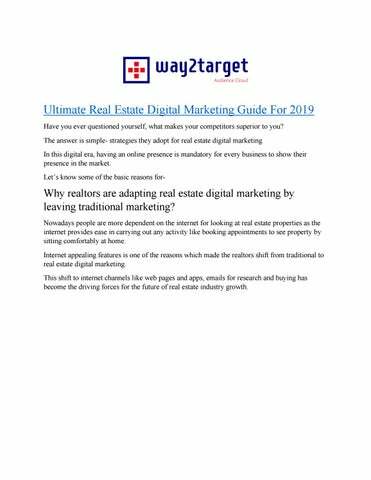 This guide can help you how to start and generate leads using real estate digital marketing and don’t forget to practice tips, ideas, and strategies mentioned in this guide. Don’t wait any longer to beat your competitors. Start your success journey with this real estate guide and become a future leader in your real estate business.